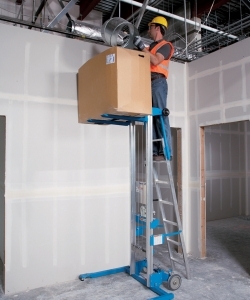 The standard base GL allows you to lift and manoeuvre in congested work areas. Compact and quick to set up. 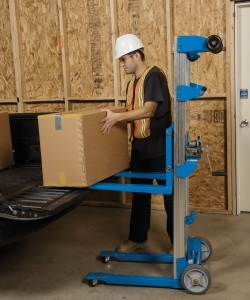 The straddle base GL has adjustable-width legs that allow the unit to straddle loads up to 91cm wide, perfect for lifting small pallets, appliances and other bulky objects. 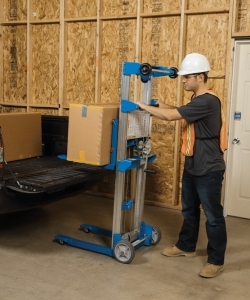 The counterweight base GL has a short leg length that lets you get close to the load, with fixed front wheels. Excellent to access loads on countertops or shelves above fixed objects. Load capacity 227Kg (500lbs) to a max height of 1.80m (5ft 11in). Adjustable leg width to lift loads of up to 0.91m wide. 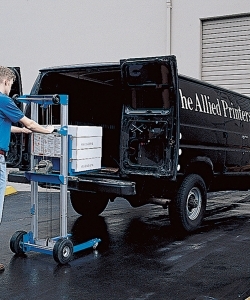 Load capacity 227Kg (500lbs) to a max height of 1.80m (5ft 11in), short leg length for access to countertops & shelves. Lifts 181kg to a height of 2.50m can be increased to 3.06m by turning the forks up. Easily loaded into a vehicle for convenient transport. Lifts 181kg to a maximum of 3.06m with the forks turned around and 2.50m with the forks in their normal down position. 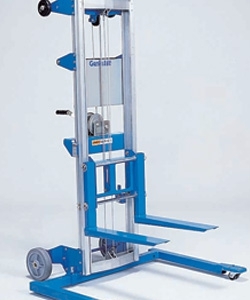 A load capacity 181Kg to a max height of 2.50m, with a maximum lifting height of 3.06m. 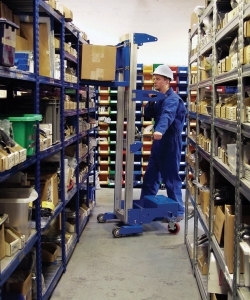 Straddle base configuration allowing lifting of items up to 0.91m wide to a height of 3.56m with the forks turned up. Lift capacity 159kg. 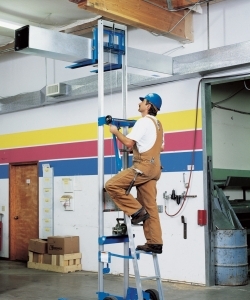 Genie Lift, ideal for material handling, short leg length. Load capacity 159Kg to max height of 3.56m. The largest lift in the range. Straddle base as standard, lifts 159kg to 3.66m, this can be increased to 4.20m by inverting the forks.